A much-awaited rematch of last year’s NFC divisional playoff game between the Minnesota Vikings (4-2-1) and the New Orleans Saints (5-1) takes place on Sunday night at U.S Bank Stadium. This prime-time game features two teams on winning streaks that are leading their own divisions and could eventually meet in the playoffs once again, making this a key matchup in more ways than one. The Saints have won five straight after losing 48-40 in a Week 1 shootout against the Tampa Bay Buccaneers, while the Vikings have won three straight games since losing to the Los Angeles Rams 38-31 in Week 4. 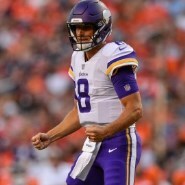 The Saints have the number one rushing defense in the NFL, but their pass defense is ranked 29th so the Vikings will probably try to put quarterback Kirk Cousins in position to safely attack their secondary from inside the pocket to try to score often and keep pace with the Saints, who are averaging almost 38 points per game in their last four outings. The Saints, on the other hand, will need to use their passing attack, ranked sixth in the league, to set up their running game. The Vikings thrive against the run, they’re ranked fifth in the NFL allowing 89.86 yards per game, but they’re just middle of the table defense against the pass (16th) so the Saints will look to use quarterback Drew Brees to find the end zone. If the Vikings want to have a chance against the Saints, they need quarterback Kirk Cousins to do a better job on third downs and inside the red zone. His poor performance in those situations is keeping the Vikings from sustaining long drives or finishing them with touchdowns. Defensively the defensive line of the Vikings has to win one-on-one battles up front to cause problems for the Saints running game and disrupt the Saints pass protection. New Orleans is currently dealing with some depth issues up front because of injuries and the Vikings could use this to penetrate the Saints backfield and limit the Saints offensively.